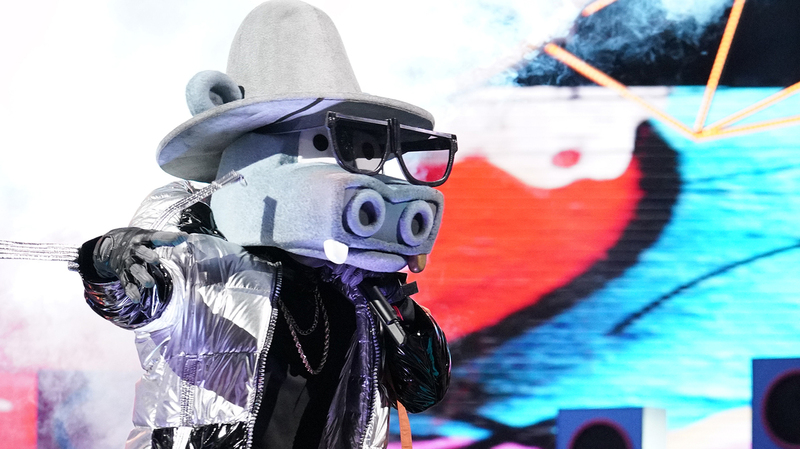 'The Masked Singer' Unmasks Antonio Brown And Gets Twitter Very Excited Fox's The Masked Singer, based on a South Korean show, is a little like American Idol — if all the contestants were celebrities hidden inside college mascot costumes. 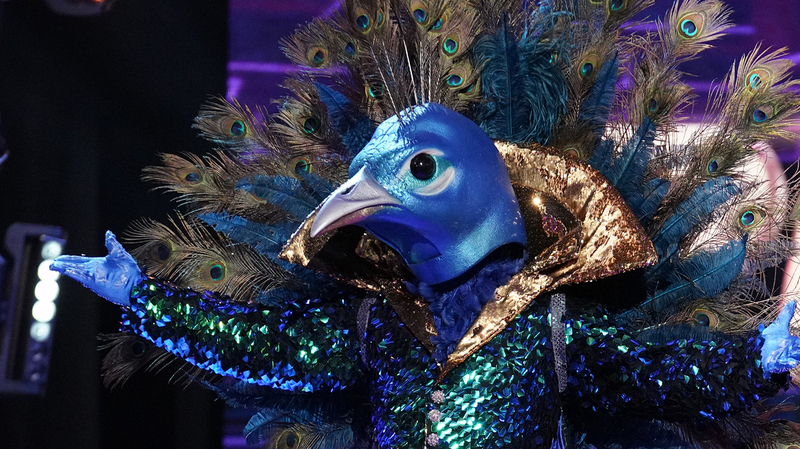 The Masked Singer dares to dangle the question ... who is the Peacock? The way it works is this: There are 12 contestants total. On Wednesday night, six of them performed. They are celebrities, we have been promised, but their identities are obscured. They are wearing various mascotlike costumes: a peacock, a unicorn, a deer. They are introduced by Nick Cannon, with taped segments in which the audience gets "hints" of various bluntness about whom they are. Then they compete in pairs, with the studio audience voting and the judging panel (more about them in a minute) weighing in, too. The three who lose their faceoffs are then subjected to the whims of the judging panel, which consists of Ken "The Hangover" Jeong, Jenny "The Less Said, The Better" McCarthy, Nicole "Pussycat Dolls" Scherzinger, and Robin "Blurred Lines, Indeed" Thicke. One of them is eliminated, and on that person's way out the door, their identity is revealed. On Wednesday night, we saw Peacock vs. Hippo, Unicorn vs. Monster, and Lion vs. Deer. Hippo, Monster and Deer (who are not, by the way, the partners in a Fisher-Price law firm) lost their battles. The judges eliminated Hippo, and Hippo turned out to be Pittsburgh Steelers wide receiver Antonio Brown. Brown is a famous football player — famous enough that he's on the cover of the video game Madden 19. But is he famous enough outside of football fandom to make that a fully satisfying reveal to a general audience when it's the only unmasking in the episode? That's a fair question. Ladies and gentlemen ... THE HIPPO! There were one or two contestants it was pretty easy to guess, especially after you saw someone else make the suggestion. If you go to Twitter, you can find out what the consensus was on the identities of both the peacock and the unicorn. But consider, if you will, the lion. The audience seemed really into the lion. The judges (who, we were promised, also don't know the identities of the contestants) went wild for the lion, who appeared to be a woman and who said she could be considered "Hollywood royalty." But if the lion becomes an audience favorite, then the lion will win and win and not be revealed until the very end. So for the answers that people are really invested in, they have to wait, what, 12 weeks? And in the meantime, they perhaps get the thrill of finding out that the peacock is who the broad consensus said the peacock was? I don't think we're that patient, given that innovations in online shopping are trying to beat two-day delivery for that springform pan you ordered. On the other hand, how can you be mad at a show that starts with a guy in a peacock outfit singing "The Greatest Show" from The Greatest Showman with utter commitment and seriousness while surrounded by bodysuited dancers twirling big wings? How can you be not even a little entertained when Robin Thicke listens to the peacock's obviously professionally trained singing voice and guesses that he might be Jimmy Kimmel? Call me a glass-half-full person, but this is the only show where you'll hear an NFL wide receiver singing "My Prerogative" while Robin Thicke astutely observes, "Hippo's moving his legs like he's under 30." And whatever else can be said about the singers, who vary in ability, the judges are much worse at guessing than any of the singers are at singing. Nicole Scherzinger guessed that the Hollywood royalty was Meghan Markle, who can't even go out without pantyhose without causing a scandal and is, I must conclude, probably not on American reality television in a unicorn costume with a multiepisode commitment. In the end, I walked away thinking two things: (1) This is very weird and stupid; and (2) HOW DID MONSTER LOSE TO UNICORN? Like the worst and corniest decor you've ever affixed to your refrigerator, it's pretty terrible, but you can't deny that it's magnetic. And unlike a lot of performance shows, it's not vicious. It's easy. It's like a sleeve of midlevel Girl Scout cookies: maybe not your favorite thing, maybe not entirely satisfying, but why say no to a perfectly good sleeve of Girl Scout cookies? Maybe you only need the one sleeve and then you put up your hand and say, "No more," but you still did OK for yourself.